With the explosive popularity of cement tiles in bold patterns, you might be wondering if this look will stand the test of time, or whether it's a trend to just wait out. The pattern of the tile above and below is called "Tulum", and it's a favorite of mine. The graphic floor of this Kelly Wearstler designed foyer was achieved with different varieties of marble and is definitely the star of the show! Charming kitchen above designed by Nick Olsen. Guest room below by the brilliant Jeffrey Bilhuber. While I don't think graphic floor patterns are necessarily trendy, I do think they are very specific, and they may be challenging to "work in" with other design elements. Novice decorators will want to keep other design elements simplistic, allowing the graphic floor to be the main feature. The exception to that would be a striped floor, because stripes go with everything! Still worried that the graphic floor trend will pass? 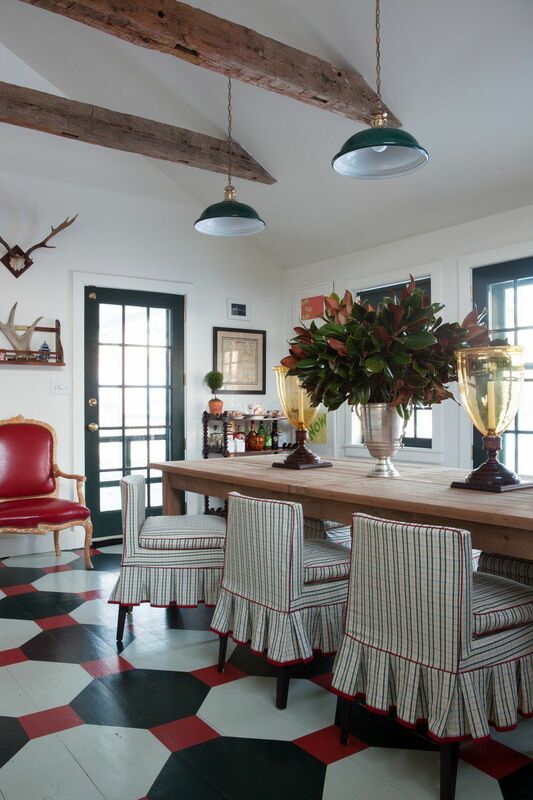 Check out this room (circa 197x) below by the iconic American decorator, Billy Baldwin. If you're considering installing a patterned floor, my best advice is to proceed with caution. Commit to a smaller area, like a powder room. Even though you may be totally convinced that you can't live without it right now, flooring is a pretty permanent and not always inexpensive to change out if you grow tired of the look down the road.